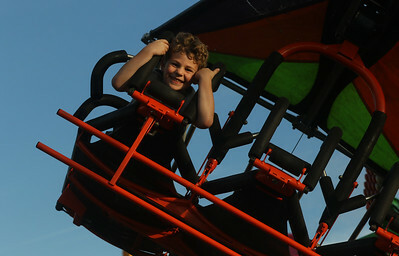 Sarah Nader - snader@shawmedia.com Zach Rysavy, 8, of Huntley spins around on a ride during Friday's 10th annual Huntley Fall Fest at Deicke Park September 25, 2015. The event features Windy City carnival, live music, a craft show, petting zoo, hayrides, a car show, food, hot air balloon rides, fireworks and more. It will run from 4 to 11 p.m. Friday, 7 a.m. to 11:30 p.m. Saturday, 11 a.m. to 5 p.m. Sunday. Free admission except 5 to 11:30 p.m. Saturday is $5 per person, free for ages 12 and younger. Sarah Nader - snader@shawmedia.com Alex Walter, 7, of Huntley practices his air guitar while listening to music during Friday's 10th annual Huntley Fall Fest at Deicke Park September 25, 2015. The event features Windy City carnival, live music, a craft show, petting zoo, hayrides, a car show, food, hot air balloon rides, fireworks and more. It will run from 4 to 11 p.m. Friday, 7 a.m. to 11:30 p.m. Saturday, 11 a.m. to 5 p.m. Sunday. Free admission except 5 to 11:30 p.m. Saturday is $5 per person, free for ages 12 and younger. 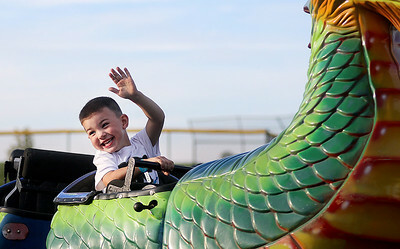 Sarah Nader - snader@shawmedia.com Grant Hill, 4, of Huntley waves to his parents while riding the Wagon Dragon during Friday's 10th annual Huntley Fall Fest at Deicke Park September 25, 2015. The event features Windy City carnival, live music, a craft show, petting zoo, hayrides, a car show, food, hot air balloon rides, fireworks and more. It will run from 4 to 11 p.m. Friday, 7 a.m. to 11:30 p.m. Saturday, 11 a.m. to 5 p.m. Sunday. Free admission except 5 to 11:30 p.m. Saturday is $5 per person, free for ages 12 and younger. 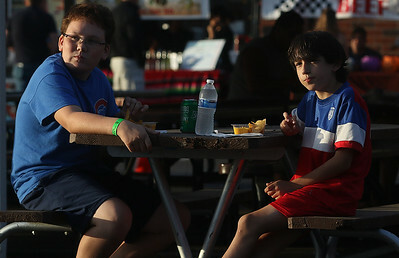 Sarah Nader- snader@shawmedia.com Wyatt Mizerk (left), 11, of Huntley and Gavin Barreto, 10, of Huntley listen to the band during Friday's 10th annual Huntley Fall Fest at Deicke Park September 25, 2015. The event features Windy City carnival, live music, a craft show, petting zoo, hayrides, a car show, food, hot air balloon rides, fireworks and more. It will run from 4 to 11 p.m. Friday, 7 a.m. to 11:30 p.m. Saturday, 11 a.m. to 5 p.m. Sunday. Free admission except 5 to 11:30 p.m. Saturday is $5 per person, free for ages 12 and younger. 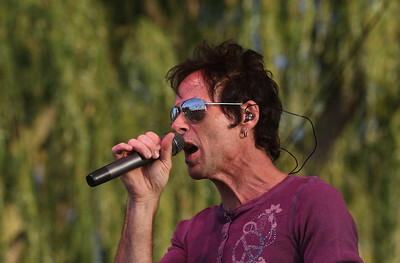 Sarah Nader- snader@shawmedia.com Mike Paterson with his band HiFi Superstar performs during Friday's 10th annual Huntley Fall Fest at Deicke Park September 25, 2015. The event features Windy City carnival, live music, a craft show, petting zoo, hayrides, a car show, food, hot air balloon rides, fireworks and more. It will run from 4 to 11 p.m. Friday, 7 a.m. to 11:30 p.m. Saturday, 11 a.m. to 5 p.m. Sunday. Free admission except 5 to 11:30 p.m. Saturday is $5 per person, free for ages 12 and younger. 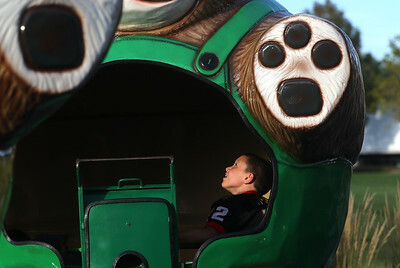 Sarah Nader- snader@shawmedia.com James Harden, 6, of Huntley rides on the Cliff Hanger ride during Friday's 10th annual Huntley Fall Fest at Deicke Park September 25, 2015. The event features Windy City carnival, live music, a craft show, petting zoo, hayrides, a car show, food, hot air balloon rides, fireworks and more. It will run from 4 to 11 p.m. Friday, 7 a.m. to 11:30 p.m. Saturday, 11 a.m. to 5 p.m. Sunday. Free admission except 5 to 11:30 p.m. Saturday is $5 per person, free for ages 12 and younger. 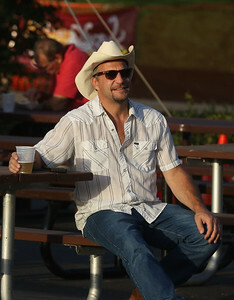 Sarah Nader- snader@shawmedia.com Bob Pulscher of Algonquin listens to the music during Friday's 10th annual Huntley Fall Fest at Deicke Park September 25, 2015. The event features Windy City carnival, live music, a craft show, petting zoo, hayrides, a car show, food, hot air balloon rides, fireworks and more. It will run from 4 to 11 p.m. Friday, 7 a.m. to 11:30 p.m. Saturday, 11 a.m. to 5 p.m. Sunday. Free admission except 5 to 11:30 p.m. Saturday is $5 per person, free for ages 12 and younger. 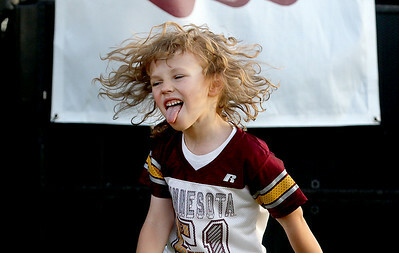 Alex Walter, 7, of Huntley practices his air guitar while listening to music during Friday's 10th annual Huntley Fall Fest at Deicke Park September 25, 2015. The event features Windy City carnival, live music, a craft show, petting zoo, hayrides, a car show, food, hot air balloon rides, fireworks and more. It will run from 4 to 11 p.m. Friday, 7 a.m. to 11:30 p.m. Saturday, 11 a.m. to 5 p.m. Sunday. Free admission except 5 to 11:30 p.m. Saturday is $5 per person, free for ages 12 and younger.